Every once in a while, amidst times of great planetary significance and challenge, a hero emerges to unite people around a noble, common cause. In times past, some heroes have wielded mighty swords and fought courageous battles, while others have chosen instead to affect change by wielding perhaps even mightier weapons, daringly using their pens and voices to bring forth poetry, song and piercing truths to illuminate the path to higher ground. 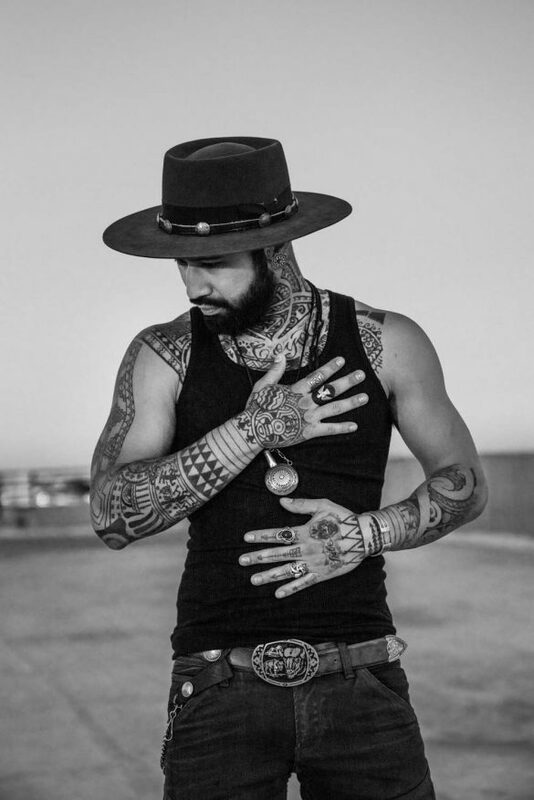 One such hero that has risen to lead in this time of globally turning tides happens to be an acoustic guitar slinging, head-to-toe tattoo-bearing, singer-songwriter, storyteller and activist named Nahko. 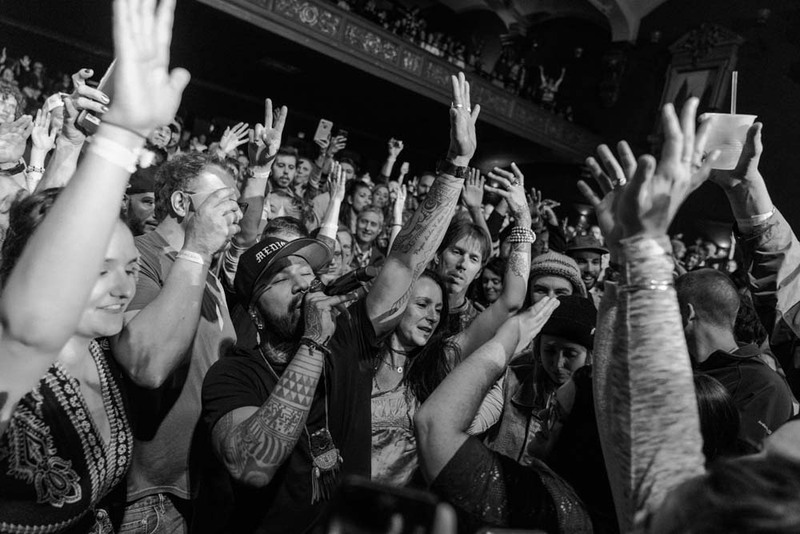 Frontman of his band, Medicine For The People, Nahko has emerged as a leader in the conscious music movement and as a force to be reckoned with. 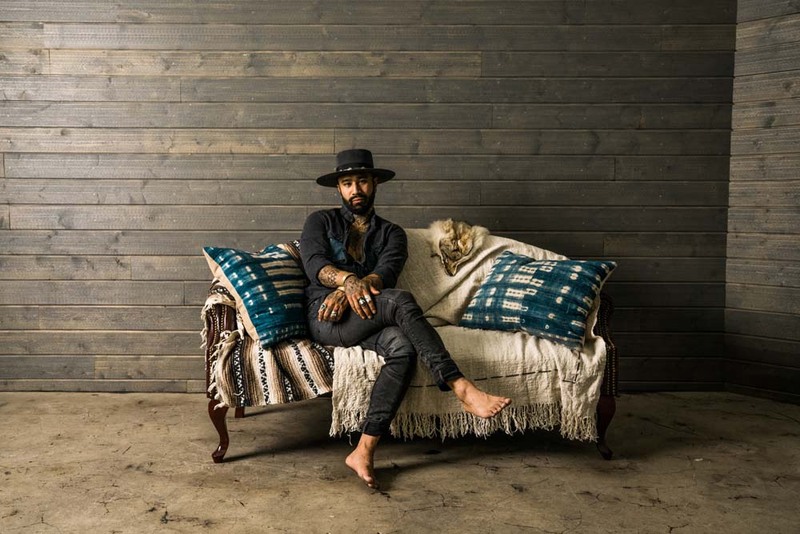 Since arriving on the scene with his fiery spirit and lion-hearted prowess for his purpose, Nahko has been claiming his place as the voice of a generation of love revolutionaries and as one of the great poets of our time. 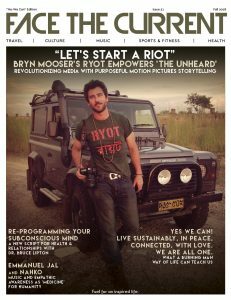 In this Face the Current ‘Conscious Artist’ feature, we get a look at the man behind the music, the message and the mission, and discover more about the heart of what fuels the Medicine movement. Nahko shares the inspiration behind his latest collection of musical treasures, My Name is Bear, and his viral anthem “Aloha Ke Akua.” Nahko also reveals his greatest heroes and some of his road-warrior life-hacks, and offers his perspective on the way forward at this ripe time in our collective evolution. Throughout the conversation, Nahko’s playful spirit and wisdom shine through and color his responses. 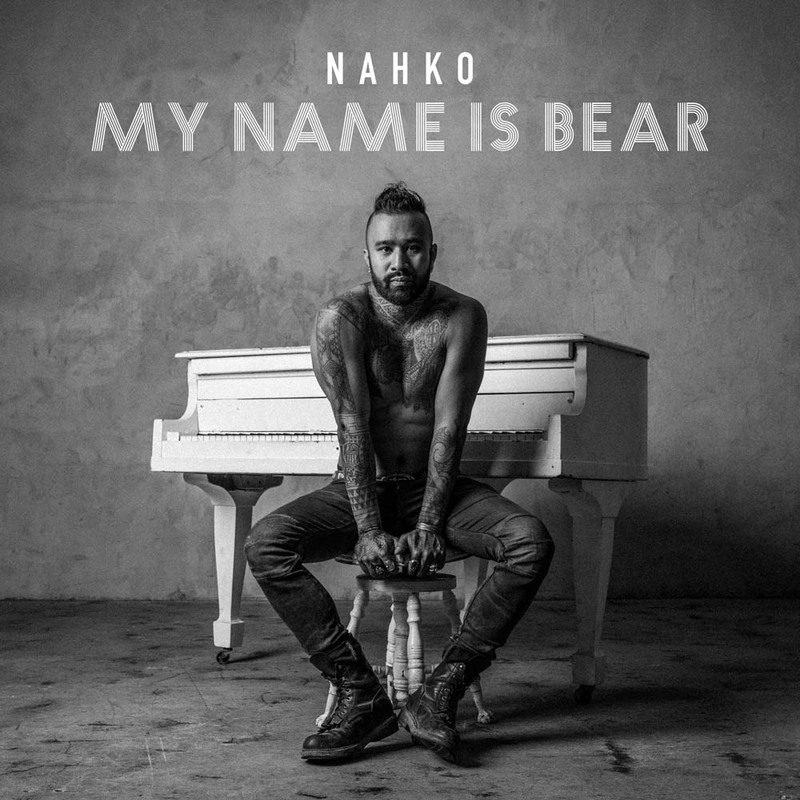 A beautiful introduction to the one named Bear to those newly discovering Nahko and his music, and a must read for Medicine Tribe faithful. Chris Assaad: Your music has been described as a “prescription for the soul,” with one of your powerful and soulful songs being “Aloha Ke Akua.” There are a variety of translations for this Hawaiian saying. What does this song mean for you, what was the inspiration for writing it, and when did you write it? Nahko: Aloha Ke Akua has been an anthem for me and many others for a number of years now. It’s a reminder and marker for me…a time when I was living Big Island and on the verge of so many different transformations as a young person. It was a hard time, but one colored with beauty, jungles, and the rawness of life. I think it was about to be 2012 and I got really caught up in the fear of a collapse in the system. I was afraid of what would happen to the island…if something happened to my family in the states and I couldn’t get to them…but, the song was a reminder to myself that divine order has its perfections even when they’re hard to see and everything was going to be ok. It’s a mantra and a prayer, too. I didn’t know the song would go viral or that people would resonate so deeply with it. It was simply for me. The bridges that each generation has been building are becoming stronger and we are becoming braver to walk across them. I think the great connectedness comes with deeper awakening. There is a desire to balance the personal and collective time in nature, to care for and live in harmony with all of creation. People who think like this are surely becoming the majority and we’re seeing massive changes in the system because of it. CA: When you first started writing these songs, did you ever imagine or have an inkling that they would reach and resonate with millions of people? Nahko: Nope! I always had a joy in sharing the songs and of course it felt great when people gave good feedback, but I never imagined I’d be touring the world and facilitating my own version of ceremony to the masses. CA: You’re known to have a very sacred relationship with your songs, often spending months crafting one piece. Can you share a little about that and your writing process? Nahko: Is that so?! Haha! Some songs take years, actually. Some songs come out in a few days. It’s a funny process that I still don’t fully understand. In the past, it’s been really clear when a song is trying to come through. Sometimes it starts with a guitar line, a poem line, and sometimes it’s a concept. Other times it’s really hard for me to finish a song, ha! It just keeps going. It can be difficult to understand when a story is actually finished and when it’s just begun. I love that about folk music. CA: What are some of your go-to self-care practices, and what helps you stay grounded and nourished when you’re traveling from city to city, playing shows, and putting out so much energy night in and night out? Nahko: I’m still figuring that out! I’m a very active person so I enjoy running, stretching, and this summer I brought my little bmx bike on the bus, so I could scoot around like the 14-year-old version of me. This summer, the focus has been demoing songs so we are ahead of the game when we start working on our next Medicine record. Being in a creative writing flow while on tour can be difficult to juggle amidst everything else but it keeps the poetry flowing. Also, wherever there is clean water to jump in I’m there. CA: Who are some of your heroes, and what have they done that moves, motivates, or inspires you? Nahko: Conner Oberst and Paul Simon are two of my musical heroes. Their poetry and musical diversity has inspired me for years. John Trudell and Winona Laduke are two of my favorite Native American activists. Their resiliency and leadership in our communities has helped fuel my fire for the last decade. I personally work with Winona on the board of Honor the Earth and she has guided me and acted as my elder through my twenties, now into my thirties. Auntie Pua Case is another elder, Hawaiian, who has been a huge leader and guide in my life over the years. Her daughter, Hawane Rios, is one of the most inspiring indigenous singers I know. They defended their sacred mountain for years and battled huge corporations and the authorities working to protect them. This kind of leadership is what has kept me going over the years. CA: What is the story behind naming your latest album My Name Is Bear? Nahko: My grandmother named me Nahkohe-ese. It’s a Cheyenne name, however we aren’t Cheyenne. We’re Apache/Taino on my mom’s side. My name means Bear. The songs on the record are kind of throwback tracks. I wrote them all between the ages of 18-21. They had been kept in the vault for over a decade and I was so excited to finally breathe some life into them. It was sort of a statement in reclaiming my name, too. To tell the story before the story that everyone had grown to love from the first three Medicine records, a sort of footnote to add more depth to the preexisting chapters. There are endless possibilities for solutions. Generational trauma affects you at every stage of your life and I am a firm believer that in facing our shadows we can become empowered in new ways. It can greatly affect the collective consciousness and how we as humans can ascend together. CA: It seems that a big part of your mission and your message is activism and being a voice for causes that you believe in beyond the stage and song lyrics. You support causes such as Honor the Earth, Be the Change, Amazon Watch, Indigenous Regeneration, InterTribal Youth, and Run4Salmon. How did you choose to work with these causes, and what are some important changes that you have been able to see positive progress in since your involvement and support? Nahko: Each cause you’ve mentioned here has fed the other one. The different founders of each one had all come to me at different times to bring me in and I just followed my nose. I’ve been involved in countless other orgs over the years, but these ones landed closer to my heart I think because of the family that I found in them. I could see clearly how I could positively impact the movement through my involvement and could witness that impact immediately. Be the Change has been able to raise tens of thousands of dollars for the other orgs by offering matching grants. Through our outreach programs in the Medicine Tribe, we’ve been able to send nearly 20 underprivileged indigenous youth to summer camps that have offered old ways teachings and cultural experiences. The northern rivers have had so much love and attention because of our work with the Winnemum Wintu…all across the country people wanted to help the Salmon and Whales. It’s been a beautiful journey watching the music do its work, hand in hand, with the movements to bring balance to our planet. CA: If you could say “Yes we can” to any particular issue, what do you believe we should aspire to overcome? CA: What does “Yes we can” mean to you? 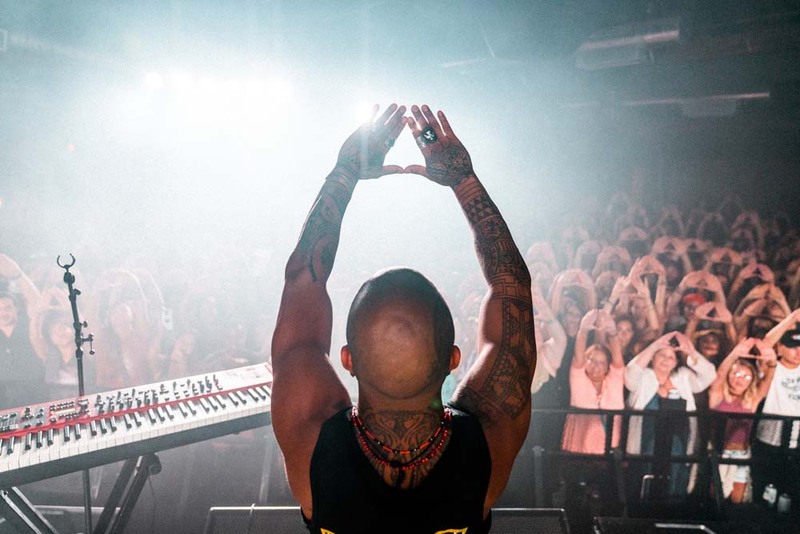 Nahko: It means that there are endless possibilities for solutions. Generational trauma affects you at every stage of your life and I am a firm believer that in facing our shadows we can become empowered in new ways. It can greatly affect the collective consciousness and how we as humans can ascend together. 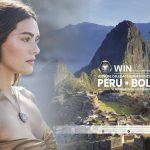 CA: If you could share one simple message on a worldwide billboard, what would it be? Nahko: You don’t have to wait to be great. CA: You’re very much about building connectedness between people, and also the connection we have with nature. How do you envision our evolution towards a greater connection? Nahko: It’s all within the young people’s revolution, I believe. There is a fascinating awakening happening all around the world. The bridges that each generation has been building are becoming stronger and we are becoming braver to walk across them. I think the great connectedness comes with deeper awakening. 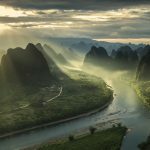 There is a desire to balance the personal and collective time in nature, to care for and live in harmony with all of creation. People who think like this are surely becoming the majority and we’re seeing massive changes in the system because of it. As women, POC, and young people continue to reshape the system with rational courage we can actually walk across those bridges hand in hand, rather than alone perhaps in times prior. CA: What’s the story behind your collaboration with Paris Jackson for your song “Dragonfly,” which you’ve described as sort of an “anthem for the young and reckless”, and “a place we have all been at some point?” Also, why/how did you choose Paris Jackson for this particular song? Nahko: When I shared with her some of the tracks as they were being developed, I told her about my vision for that particular video. But, as I wrote myself into the treatment I quickly realized it actually fit her more than it fit me. I asked her if it resonated with her and if she wanted to play the part. I didn’t know if she’d be down…crossed my fingers. She said an emphatic yes. There was a lot of really interesting connections with the dragonfly totems, where we ended up filming, so many synchronistic moments during the recording of the song and the timing in which I asked her to be in the video, it was almost like we were guided to each other to make the magic happen. We both felt it. We both knew what it felt like to resist and survive in our lives. CA: What are you currently listening to and loving that you feel others would also love and be moved/inspired by? Nahko: New records by: Snow Patrol, Dawes, and Hozier’s records are all great listens. Mac Miller’s record he put out just before he passed is also brilliant. ♦ This interview was originally published in Issue 21 of Face the Current Magazine, featured on pages 66-71. Order a print copy or subscribe to print at our SHOP. Chris Assaad is a Canadian singer-songwriter who left a promising career in law to follow his heart and passion for music. 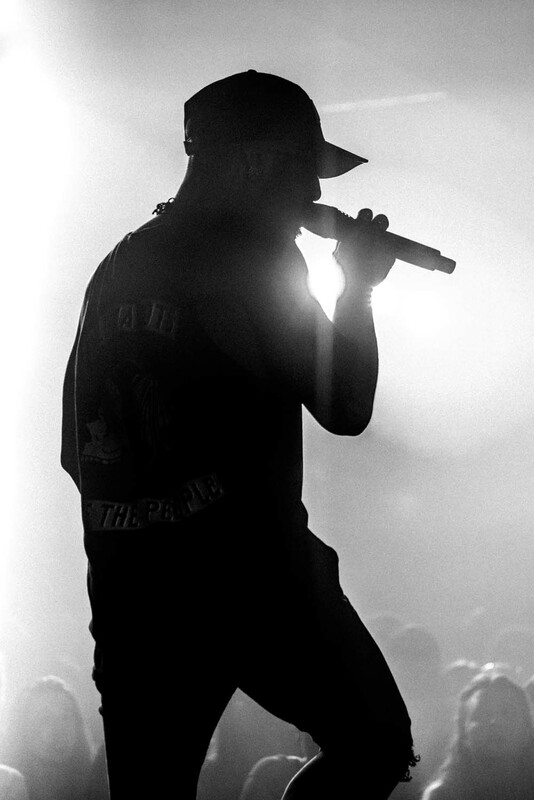 His fire for music was ignited shortly after he began exploring his love of singing when he was forced to overcome a rapidly progressing hearing loss condition. Two miraculous surgeries later, Chris was given the gift of perfectly restored hearing and a second chance, cementing his path of a life dedicated to his artistry. 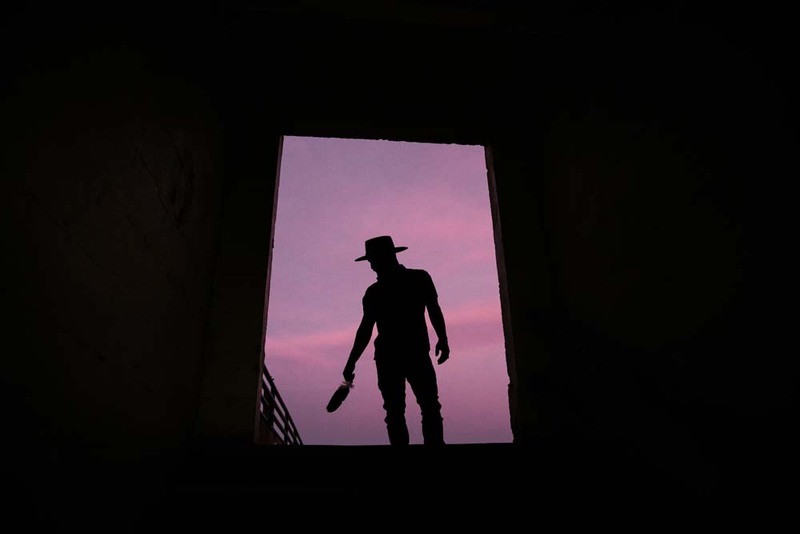 Since then, Chris has been sharing his eclectic blend of soulful roots music, heart-opening songs and stories across the globe and actively using his voice to inspire others to follow their innermost calling.